Members of the Riverview High School Chorus will perform songs throughout South County Feb. 13 and 14 for that special someone in your life. 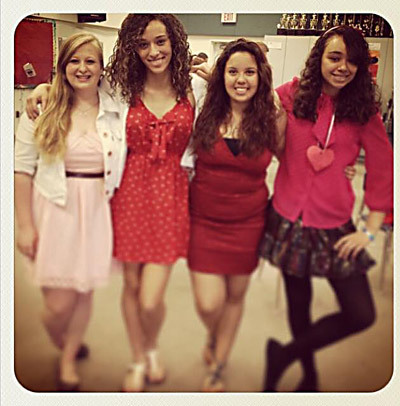 Above, from left, are, Emma Zak, Melanie Cristobal, Gina Rodriguez & Vanessa Volz. Elizabeth Stewart photo. Forget the dozen red roses in the crystal vase or the monster size box of candy. The Riverview High School Chorus has a Valentine’s Day offer that will melt the hardest heart and not bust your wallet. For $30, the chorus will visit your valentine, sing a song of your choice, deliver flowers and hand over a card. The special Valentine’s Day offer is available throughout South County, Feb. 13 and 14. Although they have been delivering their vocal valentines for four years, it’s the first time the award-winning chorus has offered the service outside school grounds. All proceeds from the offer benefit the 120-member chorus, which travels all over the state to perform in competitions. “The kids have all been practicing for this,” said Elizabeth Stewart, Riverview’s choral director. The special Valentine’s Day treat will be available Friday, Feb. 13, from 3:15 to 5 p.m. and 5:30 to 8 p.m. and Saturday, Feb. 14, from 11:30 a.m. to 2:30 p.m. and 5:30 to 8 p.m. Depending on the song, your valentine may be serenaded by an individual singer, a duo, trio or quartet. And yes, they do barber shop-style quartet songs as well. Stewart and her friend Josie Costa, who is helping with the singing valentine program, once performed a song for Costa’s mom on Valentine’s Day. “It was something her mom talked about until the day she died,” Stewart said. The funds raised by the singing valentines go to transportation costs for the choir members, who regularly traverse the state to contests, something that can cost up to $5,000 for private charter buses alone. To order or for more information, call 813-671-5011, ext. 282, from 10:30 a.m. to 1 p.m. Monday through Friday, or email sharkchorus@gmail.com, and one of the chorus booster volunteers will contact you. Payment of cash or checks should be made payable to the Riverview HS Chorus Boosters, attention Elizabeth Stewart. The chorus is working on a way to take credit-card orders.